Oh, the Anna Dress. A By Hand London staple. A classic. You could spend your life looking at images of amazing Anna dresses online and never get tired. I bought the pattern, and have so far made 4, of which only 1 actually fits me. This is a story of accepting one’s body and the importance of patience. 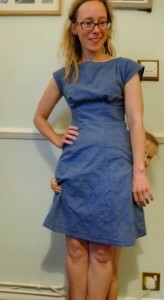 My first Anna was to be of moth printed rayon challis, from Anna Maria Horner. It was planned to be a maxi dress, with a V neck, and I spent ages ensuring everything was just so. I did make a muslin and I thought it looked OK. However, in my infinite wisdom I used silk jersey for the facing and it would not lie flat. No matter what I did, it kept popping out and threatening to strangle me. I replaced the facing but to no avail. I ripped that facing out and tried bias binding – no dice. In a fit of despair I screwed it up into a ball… no, I didn’t. I hung it on the back of my bedroom door and thought about it for a long time. And then I removed the bodice, made a waistband, and bish. A maxi skirt. Mothy skirt. There are so many colours in the print, it pretty much goes with anything. Sometimes I wear the skirt and wonder about what could have been, but I think we’re quite happy together on the whole. The many colours in the print make this quite versatile. I also managed to get a sleeveless Laurel out of what was left which made me feel better too. My second Anna is actually in use. It’s made from this nice embroidered cotton from Fabric Corner, in Lincoln. The slash neck was a lot more obliging, I used a lapped zip and it sort of fits. There is someone peeking out from behind me. Photobombing. 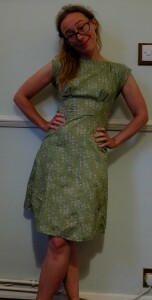 However, you can see that the neckline has a lot of excess fabric. It buckles and gapes. I also took it in too much at the back to try and remedy this, meaning this dress does not have a great deal of room for cakes and ale around the middle. This is something I gradually realised after wearing it to a vegetarian buffet restaurant – I have a nut allergy and there wasn’t much that I could eat, so I had beer for my main and cocktails for pudding. Burp. Why was I in a vegetarian buffet restaurant in that case? Shh. I don’t eat soy either, you can imagine how much fun it was. Hic. Dress 3 is cotton lawn from Crescent Trading, which is well worth a visit if you are ever knocking around Spitalfields or Brick Lane. In an attempt to remedy the gaping, I put little neck pleats in. I thought they’d suit the dress more than darts. Plenty of space for storage in the bodice here. The pleats kind of work, but my rolled hem foot made a meal of the hem and, for some reason, I used a purple zip. One day I’ll switch it for one that matches. Bit wrinkly but the purple zip really detracts attention from that. Two muslins were then made, 3.1 and 3.2. I finally accepted that there’s a difference between being able to fasten something up, and having it fit. I think I had convinced myself that I could wear patterns straight from the envelope in spite of the evidence piling up to the contrary. 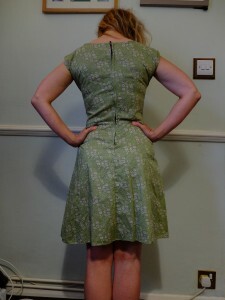 For the first I just raised the waist, which sort of worked, but then for 3.2, I used an SBA, from this tutorial on By Hand London. This worked really well, but the fabric turned out to be rather too itchy for anything other than a muslin unfortunately. Finally, Dress 4 beckoned. This one actually fits! It’s cotton poplin from B&M Fabrics in Leeds, it makes full use of the SBA, and gosh, it fits. I’m watching the girl painting and wondering how much is going to end up on the sofa. There is, again, very little cake room but perhaps that’s no bad thing. I used bias binding to finish the hem, which sticks out a lot. I am not too sure about the effect here but will leave it for a bit and see how I feel. Bit of structure here which apparently is something the cool kids like nowadays. Yes, I am short and yes, I am small! No, I didn’t buy those doll patterns in the Simplicity sale for myself. Haha. Wow, you’re committed. I would have given up on the pattern. I very nearly did. I’m pleased I stuck with it.